Pam Taylor is a visual artist whose passion for vivid colours is communicated through her paintings. The themes of her work include urban and exotic landscapes from places she has traveled to in the past, botanical images and more. Colour - an expressive use of luminous; light with bright, vivid with non-naturalistic; a juxtaposition yet complimentary, sometimes explosive. Design - always bold and spontaneous. Composition can sometimes indicate a departure from reality. Influences have been Georgia O'Keeffe, Mark Rothko, Howard Hodgkin, Jeffrey Smart, and David Hockney, with a hint of Henri Rousseau. Numerous elements, techniques, theory and design with Pam's signature style - the essence of life as seen by her perspective. 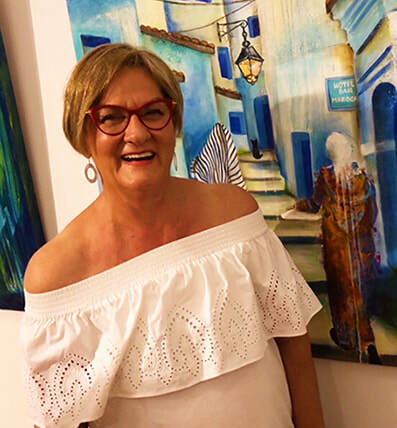 Colour is the foundation of Pam's artistic journey, fundamental elements of texture, plane and space underpin the way in which colour evokes the sensations and emotions. Colour begins in nature, and nature has in common all subjective colour memories and responses. I apply numerous elements, techniques, theory and design while drawing on my immediate surroundings to achieve a serendipitous result. Being passionate about colour, bold shapes, and my graphic style, I research ideas and genres that often arise from memories from photographs whilst travelling that capture the culture of exotic countries. Painting allows me to reconstruct a saved image from my travels, I tend to remember colour and the sensual elements of my travel experience, then what is exposed on canvas is a visual record of a time and place already past, to be reconstructed and experience again. In urban landscapes I pursue the culture and colour of a place, captivating details of the buildings, the signs, windows and doors and on occasion, maybe a happening in the composition, building a narrative.